Cat bowls are an essential part of your cat’s lifestyle. 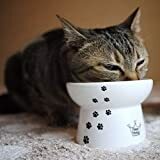 While they are seemingly simple tools to understand, cat bowls feature a surprising amount of things to keep an eye on. Not only are they a convenient place to train your pet to eat out of, but they offer a wide variety of benefits. Most importantly, the elevation promotes better digestion for your cat, since it forces it to sit more upright. This allows gravity to help get food down, which can help some cats with medical conditions. These bowls also prevent food from getting in contact with other germs and prevents your pet from playing in the food or water. When searching for a good cat bowl, look for ones that emphasize simplicity in both design and functionality. 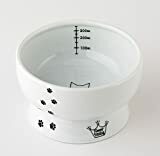 Depending on your cat’s height, it will change what type of bowl you should get. 4 to 6 inches is usually ideal for an average adult domestic cat. Also, make sure that the depth of the bowl doesn’t negate the elevation. Other convenient features can include bowl holders, rubber feet for superior non-skid effect, and easy-clean materials. The great thing about many feeding bowls is that they are compatible with many small pets. For example, this stainless steel bowl from Pro Select comes with a hanging hook, so it can mount on cages. It is available in numerous sizes and made from a 14/4 stainless steel material. In addition to being a functional food bowl for your cat, it works well with ferrets, rabbits, and small dogs as well. This coop cup from Pro Select is an excellent accompaniment or alternative to the model listed above. Instead of using hangers, it securely bolts to any wire cage with a simple twist of the wingnut. 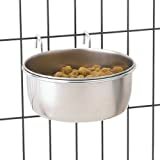 This extra level of security is useful if you’re afraid of your pet knocking over the bowl too easily. It is available in a 16 oz. size and it is made from a 14/4 stainless steel. The bowl itself is easy to clean and very durable. Coming in two attractive styles, this dual cat bowl provides great value for a cheap price. It comes with two bowls in one, saving you from having to buy two separate ones. Furthermore, it makes it easier to track, so you don’t lose one. The plastic exterior and stainless steel dishes are both dishwashers safe and durable. Both are suitable for food or water, and they measure 11.8 and 5.4 fluid ounces respectively. If you’re interested in a simple, yet effective food dish, check out this model from Ethical. It weighs just 2 lbs and is made to be hygienic and rust resistant. This silver dish is dishwasher safe and is suitable for both food and water. It holds up to 18 ounces of food/water, and the durable materials ensure it will hold up over the long-term. For consumers that desire a more premium product, this line of authentic wood holders and dual stainless steel bowls from PetFusion has you covered. By elevating the dishes on the wooden holders, it promotes better digestive health and makes it more comfortable for your pet. The holders are made from a natural Grade A pine wood with 3 coats of the water-resistant seal. The final result is brilliant and the modern aesthetic will fit your home. The anti-slip feet ensures that the food/water remains sturdy. This product also comes in both small and tall versions. This cat-friendly ceramic bowl from CAT1st is an attractive and functionally simple tool. The elevated nature improves digestion while also making it easier for older cats or pets with joint issues to eat from. The anti-spill smart inward lip prevents spillage for fussy cats, and it measures 4.3 x 4.3 x 2.9 inches. It comes in 2 adorable designs, with a cat paw or cupcake pattern. With a functional design and attractive look to it, this model from Catit is a versatile tool for any cat owner to have on hand. While it isn’t immediately apparent, the two bowls come with a high and low side, which helps with a multitude of tasks. Firstly, the low side makes it easier for your pet to reach in for food, while the high side reduces spillage while your cat is eating. The bowl base uses a glossy, black plastic and includes a rubber base to prevent sliding across the floor, while the bowls are made from heavy glass. The base holds the bowls securely and is simple to remove when placing it in the bowls. If you’re looking for a fun and convenient product to make sure your pet drinks enough water, check out this toilet bowl fountain from CSB. Make no mistake though, this product is more than just a gimmick. It comes with a water tank that holds plenty of water (up to 2 litres), and the ceramic materials are durable and glossy. The water tank gives your pet a constant supply of fresh water. The bowl itself is difficult to tip over, making it more stable than many other traditional feeding bowls. If you’re looking for a water bowl that is suitable for older cats, check out this model from CAT1st. The specially designed bowl edge prevents food or water from spilling, and the interior lining comes with measurements for more precise portion control. The materials are both microwave and dishwasher safe, making it easy to clean. The graduated measuring lines also let you tell how much water your cat has drunk at a glance. This is very important if your cat eats dry food.